(CNN) - The worst of the recession may be over for some of America’s churches, a survey released Wednesday on religions donations indicated. 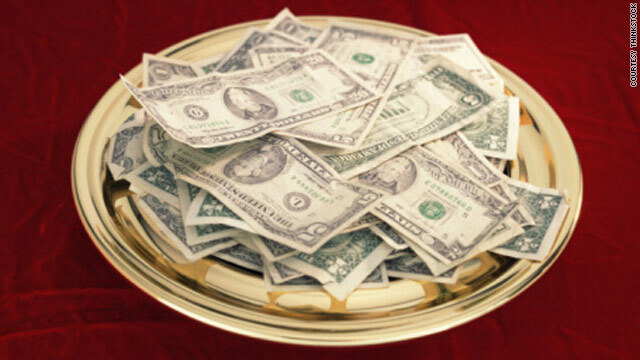 According to the survey, called State of the Plate, 43% of churches saw a rise in contributions in 2010, compared to 36% that saw an increase the year before. Meanwhile, 39% of churches saw their giving dip last year, down from 47% that reported declines in 2009. The survey, which is not scientific, garnered responses in February and March from 1,507 churches, most of them U.S.-based. The survey included responses from 86 churches from other countries, primarily Canada. “Giving increases have begun to provide a glimmer of hope for many churches,” the survey reported. The economic recession has taken a financial toll on many churches, with some filing for bankruptcy or struggling to hold onto property. Smaller churches were hardest hit in 2010, with about 4 in 10 seeing contributions decline, compared to 3 in 10 megachurches – those with 2,000 or more weekly attendees. The survey was co-sponsored by Christian ministry Maximum Generosity, publisher Christianity Today International and the Evangelical Council for Financial Accountability. Churches responding to the survey represent evangelical (24%), Baptist (23%), Independent/Non-denominational (21%), mainline Protestant (13%), Charismatic/Pentecostal (12%), Catholic/Orthodox (2%) and other Christian traditions (5%). The survey also asked about President Barack Obama’s proposal to reduce tax deductions for charitable donations among wealthy Americans, with 9 in 10 churches reporting they would be negatively affected by such a move. Next entry »Interfaith center at embattled NYC mosque? Actually the thing that scares me most is that the State of Nevada knihts it's just fine for me to drive without my glasses! I only took them off before the vision test on a lark. CNN should re-name this the "Lack of Belief Blog". God bless you all. Adulterous preachers, pedophiliac clerics, "propheteering/ profiteering" evangelicals and atonement theology"
The Bible specifically mentions this event as a a sign of the end of times. "4 Jesus answered: “Watch out that no one deceives you. 5 For many will come in my name, claiming, ‘I am the Messiah,’ and will deceive many. 6 You will hear of wars and rumors of wars, but see to it that you are not alarmed. Such things must happen, but the end is still to come. 7 Nation will rise against nation, and kingdom against kingdom. There will be famines and earthquakes in various places. 8 All these are the beginning of birth pains. 9 “Then you will be handed over to be persecuted and put to death, and you will be hated by all nations because of me. 10 At that time many will turn away from the faith and will betray and hate each other, 11 and many false prophets will appear and deceive many people. 12 Because of the increase of wickedness, the love of most will grow cold, 13 but the one who stands firm to the end will be saved. 14 And this gospel of the kingdom will be preached in the whole world as a testimony to all nations, and then the end will come. – Matthew 24:4-11"
Reading the entire Holy Bible naturally and inevitably leads to the doctrine of the Holy Trinity. Those who say otherwise never read the Bible – they must be dismissed as unbiblical, unscholarly and errorneous. Read it 5 times, I do not consider myself to be " unscholarly and errorneous." I The only logical thought that I can come to with the comment you made is that your unwilling to accept any sort of argument the counters yours. By shrugging off anything that could hurt your faith you unfortunatley box yourself in and stunt your mental capacity to learn. However I offer a counter argument you should seriously consider. If your faith is strong in a higher power thats fine, and if your not worried about loosing faith then what would it hurt to read up on opposing points of view that counter your own? There is actually a benfit from this as once you start looking into these counter ideas you may effectively argue against them since you would actually understand the topic better. Don't close your mind off in a dark room, its a waste, at least contribute effectively to the debate than slandering your opponents.